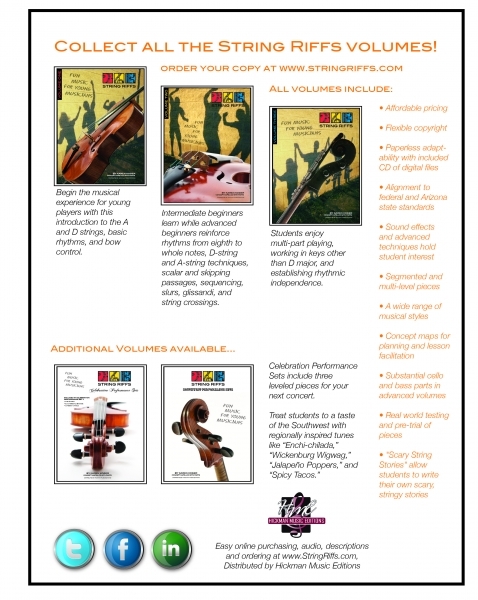 Distributor for String Riffs-Hickman Music Editions, HickmanMusicEditions.com, Chandler, AZ, Credit Cards only. Thank you to the Representatives of these stores stores who are willing to carry String Riffs. If your local store does not carry String Riffs, yet, please be sure to request the music from that store. We’re working hard to make the volumes available easily. All the websites above will ship to you for a small shipping fee.